The global CRM consulting market has grown consistently year after year, largely because the technology has gotten more complicated, operations have spread out across the globe, and personnel with the skills needed to perform certain CRM-related tasks are hard to find. 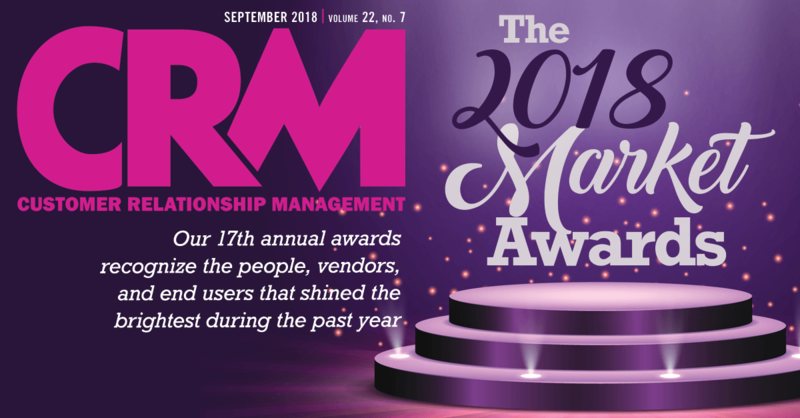 Legislation, like the European Union’s recently enacted General Data Protection Regulation, has made CRM implementations even more of a challenge. Additionally, the shift to the cloud challenged many organizations to update their outdated systems to remain competitive, and customization shows no sign of decreasing in importance. And so it’s no wonder that companies are turning to consulting firms to help them with their CRM deployments. CRM consultancies can help their clients accelerate time to value, recommend business process enhancements, facilitate change management, enable greater system utilization, and mitigate risk. These trends and the ever-increasing complexity of CRM systems make the expertise of consultants valuable and suggest that the consulting market will continue to grow for the foreseeable future. After posting a category-leading 4.2 in ability to execute last year, Accenture continued to impress analysts in that area this time around, posting an even higher (and still category-leading) 4.9. It also earned a 4.1 in company direction. Cost, however, brought it down, as it scored a category-low 2.4. Accenture “is still a global player, but is struggling to break out of its pre-cloud engagement model and cost,” says Rebecca Wettemann, vice president at Nucleus Research. Last year’s winner, Ernst & Young fell a bit this time around. In 2017, it impressed analysts with its ability to execute, company direction, and customer satisfaction. It repeated that performance in those areas this year, earning a 4.3 and a pair of 3.8s, respectively. However, cost—an area where it struggled last year—continues to be a pain point: Its cost score of 3.3 is the second lowest on the leaderboard. Wipro’s acquisition of Appirio in October 2016 prompted analysts to reward the company with a high mark for direction last year. Similar moves this year, including the launch of its Data Discovery Platform, its purchase of a minority stake in marketing services company Harte-Hanks, and partnerships with Adobe and SugarCRM, led to another solid showing in direction (3.8). It earned strong scores in the other three areas as well, especially in ability to execute (4.0). Capgemini’s star has risen over the years, and this year it claimed the winner’s spot with strong scores across the board, including category-leading ones in customer satisfaction (4.0) and cost (4.3). It also earned a 4.3 in ability to execute and a 4.1 in company direction. In fact, it scored higher this year than last in all four areas. The company reinforced its digital consulting capabilities in North America and accelerated its portfolio shift in the region by acquiring LiquidHub, a provider of digital customer engagement solutions across marketing, sales, commerce, and customer service, and analysts no doubt noticed. 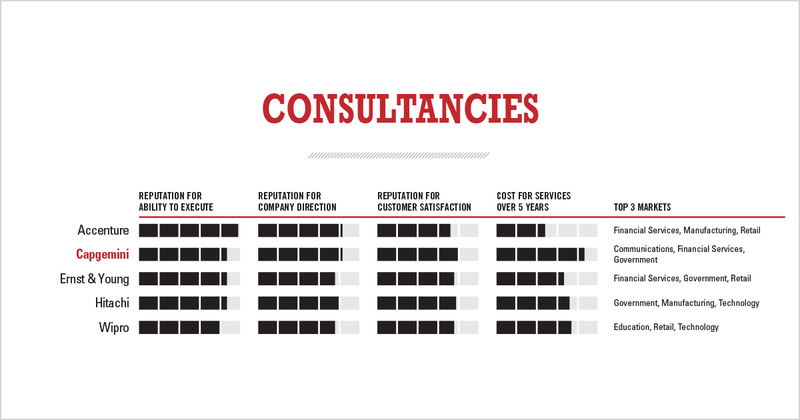 Tata Consulting Services is this year’s One to Watch after scoring well in most judging criteria, including ability to execute, company direction, and cost. Continue to keep an eye on Tata as it looks to build out its Digital Software & Solutions Group, which earlier this year introduced Connected Intelligence Platform (CIP) analytics software to help companies deliver customer experiences driven by insights from the physical and digital worlds and interactions with other companies.